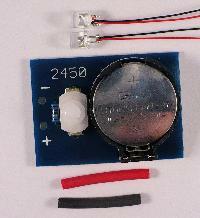 The battery light kit was made to provide an extremely simple power source using LEDs to light small projects. 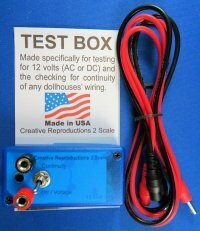 Creative Reproductions 2 Scale has created four different battery light kits to fit a variety of different sized projects. 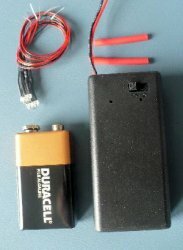 The 1220 battery is the smallest unit made and is great to place a light within a miniature pumpkin or 1" Christmas tree. You can even use a specialty LED such as a color changing or a flickering LED to add that special affect. 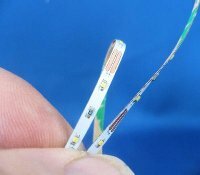 The 1220 battery/switch is only 5/8" x 5/8" x 5/8" in size and can power one or two LEDs. 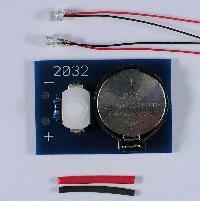 The 2032, and the 2450 battery is mounted on its own circuit board with an on/off switch and a small limit resister. The 2032 can handle up to 8 LED and the 2450 is able to handle over 12 LEDs. The 1220 battery is rated at 35 mAh: The 2032 is rated at 190 mAh and the 2450 is rated at 540 mAh.